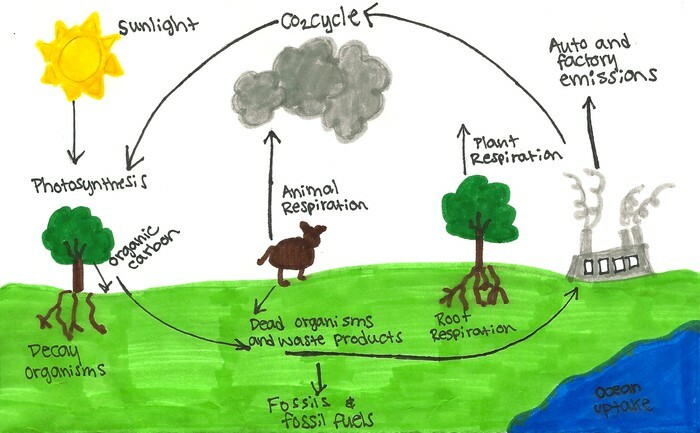 The carbon cycle is one of the major biogeochemical cycles describing the flow of essential elements from the environent to living organisms and back to the environment again. 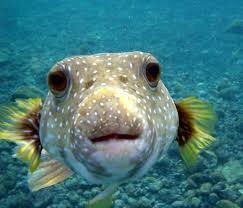 Carbon is an element found in nature it can be found in animals, plants, soil, the ocean, and us. 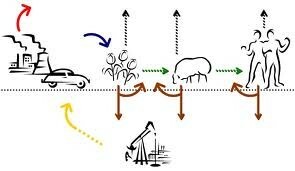 If carbon gets in the atmosphere it warms up our planet. 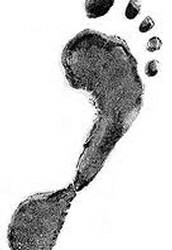 Your Carbon Foot Print is how you affect the world how much stuff you use or eat, how much you drive. All this stuff may seem small but we all do it and it adds up. 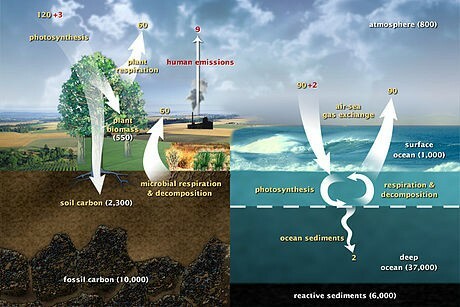 Carbon in the earth's atmosphere exists in two main forms: carbon dioxide and methane. Carbon dioxide is the more important of the two. 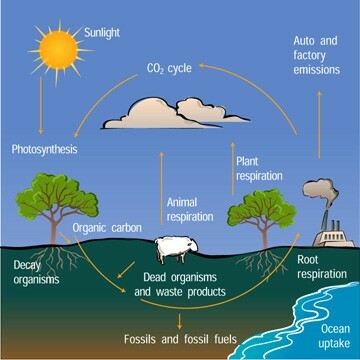 Carbon leaves the atmosphere by photosynthesis. The gases heat up our planet. 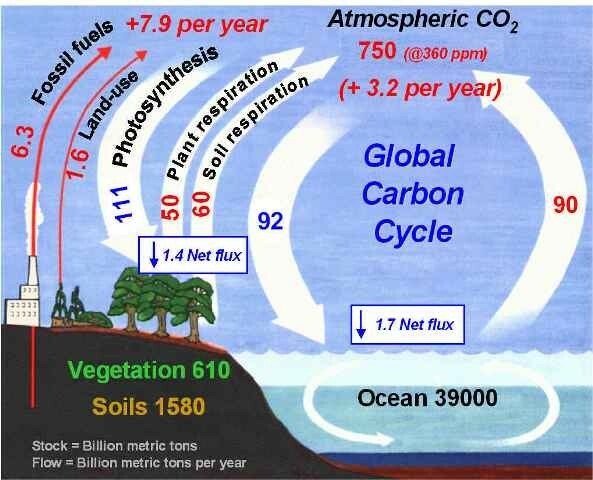 The way carbon gets out of the atmosphere is Photosynthesis (plants). It transfers the carbon into the ground. When carbon enters the soil it can sit there for hundreds of years. 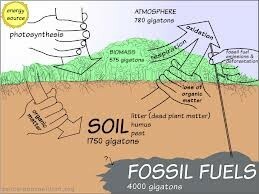 When the carbon sits there it starts to turn into fossil fuel such as coal, oil, or gas. 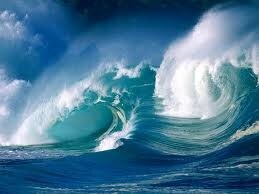 The oceans' surface layer holds large amounts of dissolved organic carbon that is exchanged rapidly with the atmosphere. The deep layer's concentration of dissolved inorganic carbon is about 15% higher than that of the surface layer. 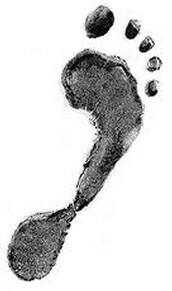 Dissolved inorganic carbon is stored in the deep layer for much longer periods of time. 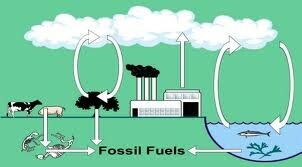 Some of the carbon dioxide stays as dissolved gas, but much of it gets turned into other things. Photosynthesis by tiny marine plants in the sunlit surface waters turns the carbon into organic matter. Many organisms use carbon to make calcium carbonate, a building material of shells and skeletons.